2) Laundry was a challenge- getting it collected from all over the house, washed, dried, folded and then the trickiest part...put away. It seemed like someone was always asleep in one of the rooms I needed to get into, so baskets of clothes got left out, attacked by the baby and generally forgotten. So we came up with a new solution. It is admittedly a little odd, but so far it is working really well for us. We made a "family closet." I first got this idea from the Duggar family (and NO, I have no intention of having 19 children...at least not simultaneously), and it seemed like it would simplify things for us. 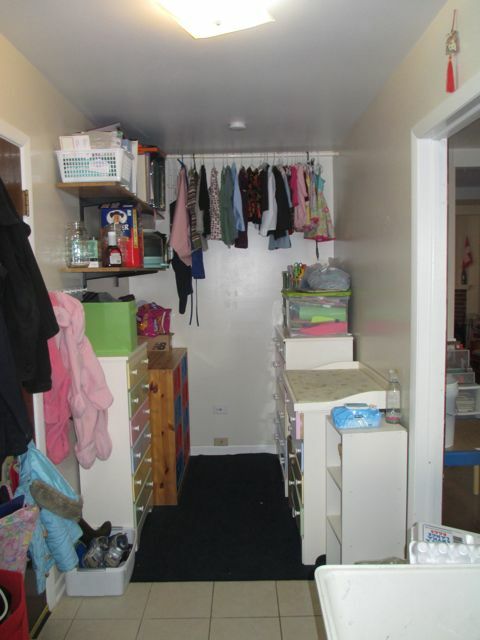 We moved all the kids' dressers into our laundry/mud room, as well as the changing table. We laid down a piece of carpet that we had, hung a tension rod to hang dresses, and put out a basket for kid shoes. Here is a picture of the other half of the room. You see the washer and drier, utility sink and the clothes hamper. I like to keep pretty pictures the kids have made for me in the laundry room to remind me how much I love them while I clean their stinky socks. You can also see the rather "comprehensive" fuse, internet, cable, and other unidentifiable wire box that the previous owners installed. Hubby took one look at it and knew this was the house for us! I cannot tell you how much the family closet has streamlined things for us. 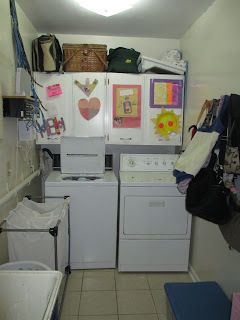 Dirty clothes go right into the hamper in the laundry room. Socks and shoes are kept in the same room...right by the door we use to come in and out. I can rinse the diapers in the utility sink right away, which makes the diaper laundry so much easier. I can also treat stains right away. I fold the laundry on the changing table and put it immediately into the correct drawers. When I go to pack clothes, all three of my children's dressers are right there. Outgrown clothes can go immediately out the door to the correct bin in the garage. Hubby and I still keep our clothes in our nice walk-in closet, but for the kids, this is working great. Eventually I assume they will stop wanting to change clothes in the laundry room and will choose to lay out their clothes the night before, or collect them and change in their rooms. But for now, they seem pretty happy with it...and I certainly am as well! 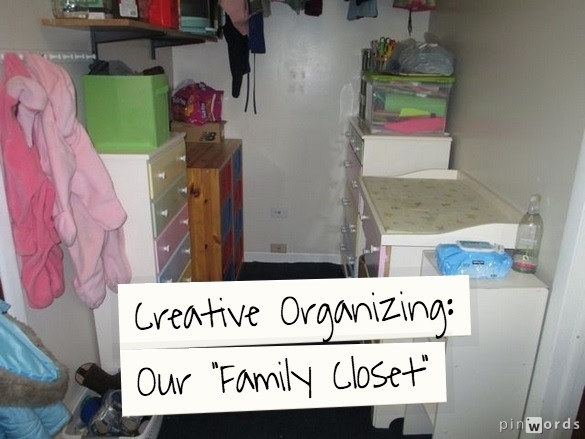 What crazy creative organizing have you done at your house? What a great idea! It looks so much more handy. That's so wonderful about helping with Safe Families. I've know several around me that have done it. God bless you all!